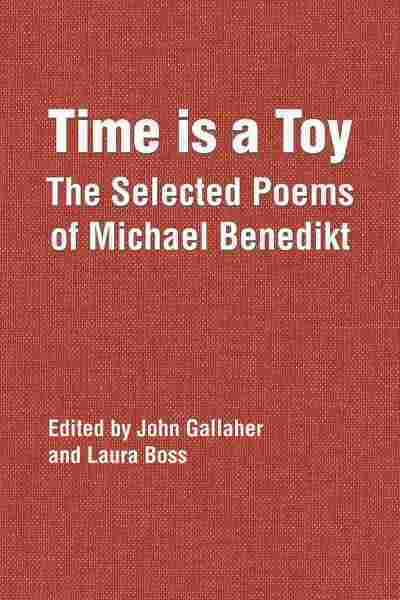 Book Review: 'Time Is A Toy' Michael Benedikt was an exemplary poet, a dedicated editor and an agoraphobic recluse. His work was almost lost forever — until two poets rescued his archive and published a selection, Time is a Toy. It always feels good to see a poet rescued from oblivion. Michael Benedikt (1935-2007), a prominent figure in the poetry scene of the 1960s and 70s, was not exactly an important poet, but he was — and in his work, he remains — a deeply enjoyable one. He made some significant contributions, bridging the gap between the conversational poems of major New York School figures (especially Frank O'Hara) and the surreal poetry that became popular in the '70s. And he helped define the strange, comic and quotidian tone of the American prose poem, which remains one of our poets' favorite forms to this day. He was also a dedicated editor of anthologies, especially the groundbreaking The Prose Poem: An International Anthology, and was briefly the poetry editor of the Paris Review, so he played a small part in shaping the direction of poetry to come. Most importantly, though, he was really good — accessible, funny, sad, sympathetic. He was the kind of poet one might recommend to someone a little afraid of poetry. We almost lost this body of wonderful work altogether. Benedikt published five books in his lifetime; all are now out of print. He suffered from agoraphobia, and for almost the last three decades of his life, he lived largely as a recluse in his New York apartment, where he prepared several other manuscripts for publication, but never sent them to a publisher. Fortunately, poets John Gallaher and Laura Boss preserved these works; Boss actually saved Benedikt's archive from ending up in a dumpster. They explain how in helpful introductory essays, putting Benedikt in context and narrating the process of unearthing his poetry. And now, in Time is a Toy, we have the chance to see Benedikt's whole remarkable career unfolding. The gravedigger's eye is hollow. It is surrounded by a thoroughly contemporary serenity. The dynamite salesman's eye is like a pool, in which he who leans to drink may be lost. Drifting forever, like a cloud. The billiard-player's eye comes to a point. It is like a mild wine. Each billiard-player suffers from imperfect nostalgia. These poems are simply delicious — one wants to gobble them one after another. As silly and improvisatory as they seem, the stakes are always high; the poet wants to get close to his life, but it's hard for him. He must describe the obstacles, asking, for instance, "isn't that you I see concealed underneath there/ Inside the shield, or conning tower, of your head." Then come the sinister prose poems of Mole Notes (1971) and Night Cries (1976), jerky and odd as those of James Tate and Russell Edson, but more personal. What better representative for an agoraphobe's experience than a talking mole in search of friends at "a large garden party in Scarsdale"? Very politely, he asks: "Would anybody here like to come down sometime and see my worm collection?' Evidently not; suddenly he feels an empty hors d'oeuvres tray whizz past his whiskers. A playful, slightly masturbatory sexuality creeps into these poems' explorations, as in the hilariously creepy "The Journey Across Your Thigh," in which "Our ten intrepid travelers set out across the vast expanse by traversing the narrowest section of the promontory." I'll leave it to you to imagine where they end up. It's a specially designed pistol for committing suicide, with a muzzle at one end and on the other a bottle-opener, in case you should decide to drink yourself to death. How about that for an introduction! And it tells us not only the kind of poet Benedikt is, but why he's still so relevant now. He has a lot to say about our Internet age and our obsession with vicarious living — in fact, Benedikt maintained a presence on the early Internet toward the end of his life. And he offers a prototype of one of the kinds of poems many poets today are trying to write: maybe a bit silly and flippant on the surface, but, more deeply, earnest and eager to connect. Thankfully, we've got Benedikt back. We need his unusual kind of wisdom.